Last week, we continued to explore positive relationships. Did you know that it’s possible to feel like we are supporting someone else, when they actually don’t feel supported? What matters for successful, positive relationships is perceived support (1). When we share our stories in a trusted relationship, we give the other person an opportunity support us. It’s a bid to obtain understanding, validation, and caring (1). Perceived support occurs when we feel understood, validated, and cared for. It is both personal and dynamic. Last week, I invited you to think back to a moment when you felt supported. Did you accept my invitation to get curious, and aim to discover how and when you feel most supported? As you looked back at moments of perceived support, did you discover any themes? And/or did you take it a step farther and share how you feel supported by a loved one within a particular relationship? If so, what did you notice? I found this exploration quite helpful! It turns out, I feel the most supported when someone shares their time. Presence matters to me beyond any gesture or gift. In a moment of struggle, celebration, or simple ease, I feel the most supported when I am sharing the experience with a loved one, because I value quality time with others. This can take many forms, from time spent together on a trip or over a meal, to moments of serendipity and surprise, to simple 5 minute call. Time spent matters to me. I also noticed that when others use words of appreciation to show support, I actually feel a bit uncomfortable. I can see it’s well intended, but I don’t get the same feeling of support. Instead, I feel quite vulnerable. So, learning to hear and accept compliments graciously while sharing genuine compliments when I think of them is one way that I am working to receive intended support and share support with loved ones who perceive support differently. I hope you are beginning to see why perceived support matters! As I mentioned last week, the way we respond matters. It matters when things are going poorly, and it matters when things are going well (2)! Dyadic relationships are essential for one’s well-being and overall satisfaction with life (3). In times of joy, as in times of despair or challenge, we have an opportunity to provide support. This week, I want to introduce Active Constructive Responding or ACR as one way to improve communication and build trust in relationships. ACR is engaged and authentic responses to positive (or negative) experiences (3). It is a uniquely helpful way to respond, because it uses all three components of responsiveness for perceived support: understanding, validation, and caring (4). 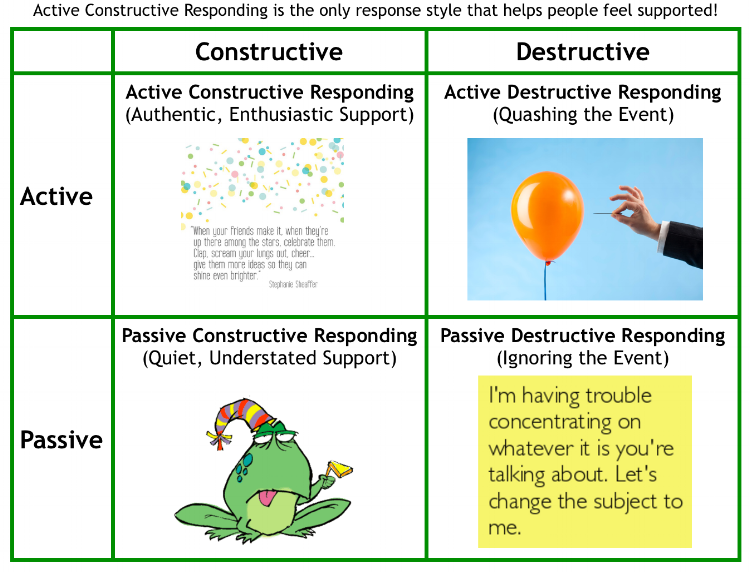 Which of these four possible responses would help you feel most supported? Let’s see… In the first response, my friend is actively destructive. The response is engaged and active, but it is quashing my excitement about my new job by moving to personal feelings and logistics. It’s important to note, we don’t always do this intentionally. 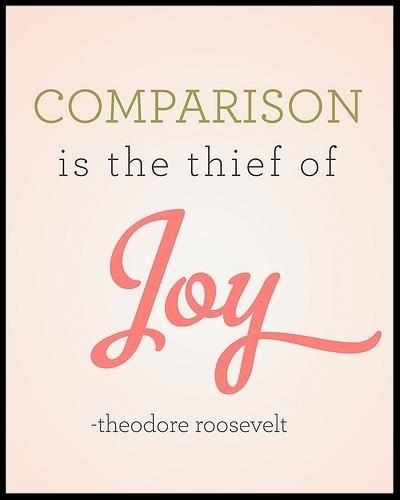 Sometimes we let worry, comparison, or personalization guide our response. When this happens, we simply miss the opportunity to share in and help a loved one engage in their good news. In the second response, my friend is ignoring the event or passively destructive. It is difficult to feel seen or valued by someone when your bid for support is ignored. This response fails to acknowledge that I shared the good news at all. Again, this type of response is not always intentional. It can happen when we are distracted or are unaware of what our loved ones value. The third response is passive, constructive. There was a moment of support. A simple acknowledgement of the positive event, and a lack of engagement in my news as the conversation immediately turned to something else. And finally, we have the fourth response which is an example of Active Constructive Responding or authentic, engaged support. You’ll notice that the event is acknowledged, my feelings are heard, valued, and reflected back to me, and there is a question to engage, inviting conversation about my news. Here, my friend is taking my bid to provide understanding, validation, and caring. ACR is the only type of response that helps me savor my good news and capitalize on my positive emotion. It also builds our relationship by seizing the opportunity to offer support that I can perceive. In this pretend scenario, ALL of the responses were given to me from a dear friend, so likely this person does actually understand, value, and care for me. Hopefully, this example illustrates how our response in any given moment can send messages that impact how we feel and received support. I hope it also helps you see how sometimes we miss opportunities for support when we aren't engaged in Other-Focused Listening. How does it strengthen the relationship? ACR can enhance the degree to which positive events are experienced and increase both positive affect and overall well-being (3). Remember, positive emotions broaden and build our resources (5) creating an emotional contagion that impacts those around us (6). So, when we share good things with someone else and make a bid for support, we offer them an opportunity to capitalize or enhance our positive emotion (7). Using ACR helps us capitalize on positive emotions and create an upward spiral to strengthen our relationships (5, 7). ACR conveys responsiveness by demonstrating understanding, validation, and caring in both positive and negative events. It engages the person who shares and offers space to be heard. It requires us to tune in and listen, so we can acknowledge when something is valued by the other person. Research even supports that ACR enhances satisfaction in romantic relationships by building trust and intimacy (3)! That said, ACR only works when it is authentic. We have a keen internal radar for inauthentic expressions of support or general BS. So, this doesn't mean that you always need to be an enthusiastic cheerleader. In fact, if that's not you style, it may never mean that. This model is meant to explain how the ways re respond can impact others. It also helps us appreciate that joy (like all emotions) can sail away quickly. So, I believe ACR also highlights the value of meeting your loved ones in the moment where they are to strengthen relationships. This week, I invited you to practice ACR! Choose a person you are close to and track how you respond to their good news. Simply take notice at first. And don't worry! It doesn’t have to be a big piece of news. It can be something simple they are grateful for or a a moment that happened to go well. Hopefully, you will be able to notice your response at least three times this week. Then take a look. Try to be an anthropologist in your own life and set judgement aside. Ask yourself - what do you see? Are you active or passive? Constructive or destructive? After determining a pattern (if there is one), commit to respond with ACR, and try it out the next time some good news is shared. Let your authentic enthusiasm show and help the other person savor the good stuff (8)! I hope you enjoy using active constructive responding with those you love! Join me next week for another look at positive relationships. Until then… be well. 1. Reis, H, Shaver, P. Intimacy as an interpersonal process. In S. Duck & D. F. Hay (Eds. ), Handbook of personal relationships: Theory, research, and interventions (pp. 367–389). New York: Wiley; 1988. 2. Gable S, Reis H, Impett E, Asher E. What do you do when things go right? The intrapersonal and interpersonal benefits of sharing positive events. Journal of Personality and Social Psychology. 2004; 87, 228–245. 3. Gable S, Gosnell C. The positive side of close relationships. In K.M. Sheldon, T.B. Kashdan & M.F. Steger (Eds. ), Designing positive psychology: Taking stock and moving forward (pp.265-279). New York: Oxford University Press: 2011. 4. Gable S, Gonzaga G, Strachan A. Will you be there for me when things go right? Supportive responses to positive event disclosures. Journal of Personality and Social Psychology. 2006; 91(5), 904-917. 5. Fredrickson B. Positivity: Groundbreaking research reveals how to embrace the hidden strength of positive emotions, overcome negativity, and thrive. New York: Crown Publishers; 2009. 6. Fowler J, Christakis N. Dynamic spread of happiness in a large social network: Longitudinal analysis over 20 years in the Framingham Heart Study. British Medical Journal, 337, a2338; 2008. 7. Langston C. Capitalizing on and coping with daily-life events: Expressive responses to positive events. Journal of Personality and Social Psychology. 1994; 67, 1112–1125. 8. Peterson, C. A primer in positive psychology. New York: Oxford University Press; 2006.